at Congo Cross, the day has begun. and prayers to be said. Balmaya: One of the favorite restaurants in Freetown! ...BUT poor little Roo lies on the floor with his "well-loved friend". He has malaria. Moment by moment the streets become more and more active. Taxi cabs and pedestrians dart from alley to street. Papers fly in the wind and tin cans roll to the gutters. Rush, Rush...Everyone is "taking care" of business. ...all the while, ill children are lying on the floor like Roo throughout the city, the country - unnoticed by the day's activities. Roo is fortunate, because of you, through NHA, he has some medications available. He has a roof over his head. Even so, malaria (any illness) is dangerous in Sierra Leone. No one is exempt from its effects. 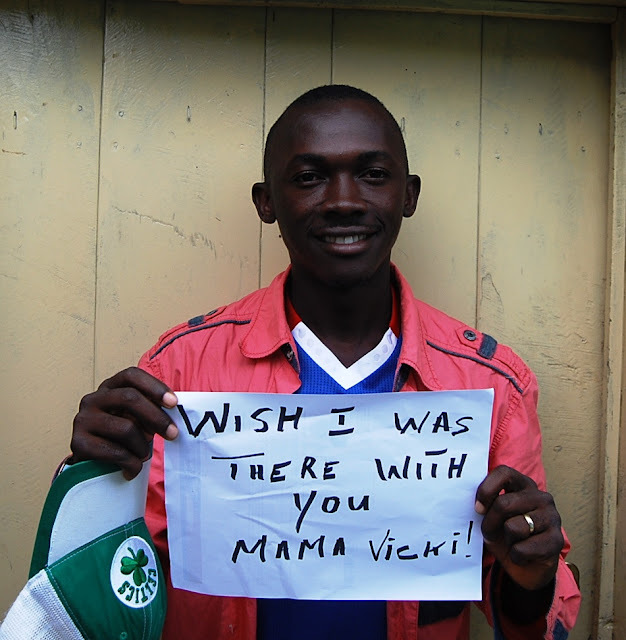 The minimum healthcare efforts we depend on in America are a far cry above what a Sierra Leonean can hope for. NHA can't cure it all or feed everyone, but working together, we can make a huge difference in many, many lives ---one life at a time . Don't look away, don't give up - don't undo in doubt what you began in faith. Give to Nazareth House Apostolate today! Some of the classes of the NHA School gather to begin the school day. As Mama Vicki recovers from surgery today, we've just lost a toddler again in Sierra Leone, ROO's best friend, playmate and neighbour. Borbor as he is called met his untimely death after a high fever attack last night. I guess another case of malaria. He dropped the young body before reaching the hospital. Today ROO returns home from school without a friend. My heart aches... Please keep Borbor's mother in your prayers. 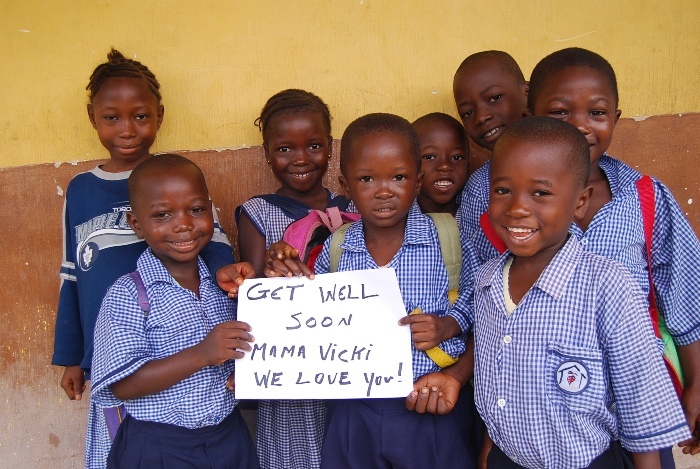 I now realize how MAMA VICKI always feels when am very sick here in Sierra Leone and she cannot be here to take care of me. Frankly enough, its has always been me, or a member of my family or a poor kid like Sheku to name but a few. I will refer to my worst trouble early this year when i was involved in that terrible road accident. Mama Vicki almost chew the phone wanting to be here. 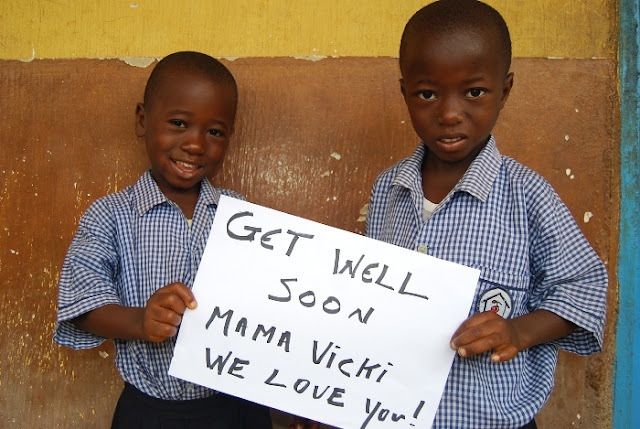 As i write this, Mama Vicki is currently in Surgery in Kentucky and am unable to be with her. However, i am still connected to her through my prayers and i ask you all to pray too. The idea of her in Hospital is making me sick and as i pass the word here in Sierra Leone about her immediate surgery i can see the worried eyes of thousands too. I trust God to take control but its just not easy to see or hear that the one we all look to is down. I cant handle it without her help and begging spirit for the poor and needy here. I just cant do anything without her so we want her to be ok. The kids at our NHA school in Kabala needs her, not to mention of the lot in the remote villages where she always take care of the sore feets, feding the hungry, or take care of the worm packed belly etc. so much in her hands that without your helping hands she cant do it all. Oh how i wish to be near a good Woman and a mother to many here. Mama Vicki is everything and i cant say more about her but ask you all to pray. And as she recover from this surgery, please do not forget to carry on the work of Nazareth House. I will prefer we make it easier on her today and give money towards the unfinished compound in Kabala. We still need to get all this down before Christmas and we are still behind in paying the remaining money. There is only one MAMA VICKI i know who has always been there for us all, and trust me she will be hard to find if we ever lose her. Today am in her shoes, reminding all to help out the work of NHA while she is out of Surgery, This i promised her if only she will be ok.